School may be out but it is important to keep your child's brain working and learning throughout the summer so that it isn't such a hard transition back to school in fall! If you are looking for awesome learning activities, look no fruther than Carson-Dellosa, one of my favorite educational companies and one that has really helped my son learn while having fun! Best of all, they offer great prices and a great clearance section! I don't know about you but I looove a bargain. And so I am loving their Clearance Sales! 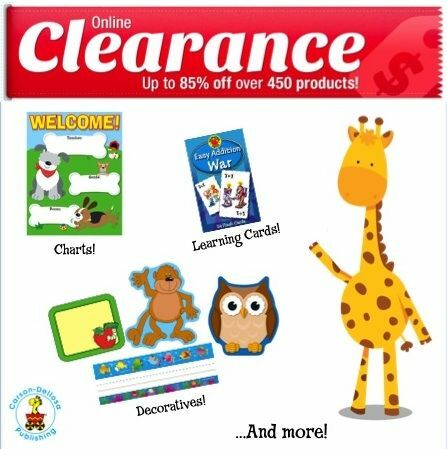 This is a great chance for you to get a head start on those classroom and home learning supplies at really, really low prices! I'm talking pocket charts for $5.70! Bulletin board sets for under $5! Books, puzzles, learning cards and so much more! Plus - over 100 items for UNDER $2! For K— Grade 5. Build critical thinking skills and reinforce essential math skil ls with the CenterSOLUTIONS® for the Common Core Thinking Mats for kindergarten. Each set includes 15 write-on/wipe-away mats with coordinating game cards. The cards and the mats are color coded for easy organization and cleanup. The mats can be used individually or with partners and are open-ended to be used again and again. With activities that can easily be customized to specific learning needs, the Thinking Mats are perfect learning tools for centers, learning stations, and group or individualized instruction. The set includes a 16-page resource guide with recording sheets to allow students to explain their work in the context of the Common Core Standards for Mathematical Practice. For K— Grade 5. Each write-on/wipe-away card contains critical thinking activities that promote active learning for Common Core success! The set contains 50 language arts cards and 50 math cards, each printed with a standard on one side for easy planning and progress tracking. The cards are perfect for centers and learning stations, individualized instruction or skill differentiation, math and reading journals, and much more. The set includes 100 4" x 6" task cards, one introduction card, and one divider. A free online resource guide provides a standards matrix, recording sheets, and an answer key. So keep your children busy learning and having fun this summer with product from Carson-Dellosa! Plus, make sure to check out their clearance section for a great deal! Buy It: You can purchase all Carson-Dellosa materials and products from the Carson-Dellosa website. Win It: Carson-Dellosa is generously offering (1) CenterSOLUTIONS Task Cards & CenterSOLUTIONS Thinking Mats to a lucky winner!